I received complimentary products to provide this review and giveaway. All opinions are my own. Welcome to the "Gifts of Love" Giveaway Hop! & Michelle from Mama's Baby Cupcakes. 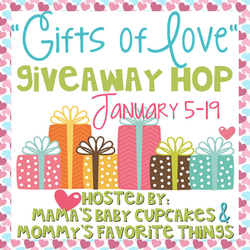 This giveaway hop has a Valentine's Day Theme, which means anything family friendly is up for grabs that you would give to someone for Valentine's Day. Each blog has a minimum prize package of $25 per winner and after visiting my giveaway, make sure you use the linky below to visit a few of the other blogs to see what they have to offer for you too. I recently had the opportunity to try out Jamberry Nails. I decided to try them out on my daughter for her birthday and Christmas, but I thought these would make a GREAT Valentine's Day gift as well! I decided to get some Jamberry Juniors for my daughter, one in a turkey design for Thanksgiving and another set in a Snow & Ice themed wrap for her FROZEN themed December birthday party. My daughter was actually pretty patient during the entire process which you can view how they are applied below. They lasted on my daughter for about a week. Which I was actually very happy with. Nail polish only lasts on her nails for a few days before chipping drastically. My daughter has a sensitive ears and even she wasn't bothered with the fact that we had to use a hair dryer to help apply them. Children's nails can be oily, so I would follow all the directions in the video before applying. Including using alcohol to clean the nail and pushing back the cuticle. I didn't do this, but Jill just sent this over to me. Check the cuteness you can get for Valentine's Day! 2015's Color of the Year is called Marsala. Much like a rich Marsala wine, this reddish-brown hue features natural earth-tones, characteristic of exotic spices. The sophisticated yet neutral shade allows you to pair designs in the Color of the Year collection with your personal sense of style. Check out Jamberry's 4 wraps inspired by this color. 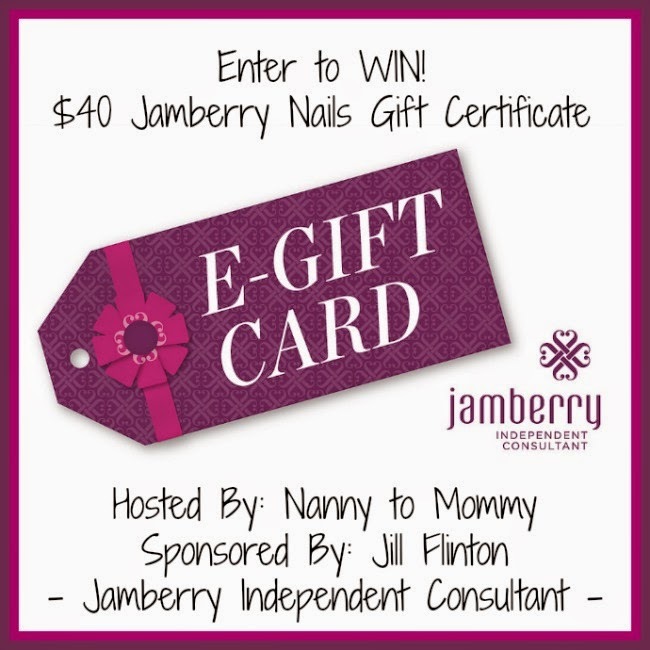 I'm excited to offer one lucky Nanny to Mommy reader the opportunity to win a $40 Jamberry e-Gift Card to give to a loved one or keep for yourself! Entry is simple, just follow the prompts on the Rafflecopter below. Make sure you are following us on Facebook to stay up to date about all of our fun giveaways! This giveaway is open to US & CAN, must be 18+ to enter. Nanny to Mommy, Mama's Baby Cupcakes, Mommy's Favorite Things, and the "Gifts of Love" participating bloggers are not responsible for sponsors who do not fulfill prize obligations. 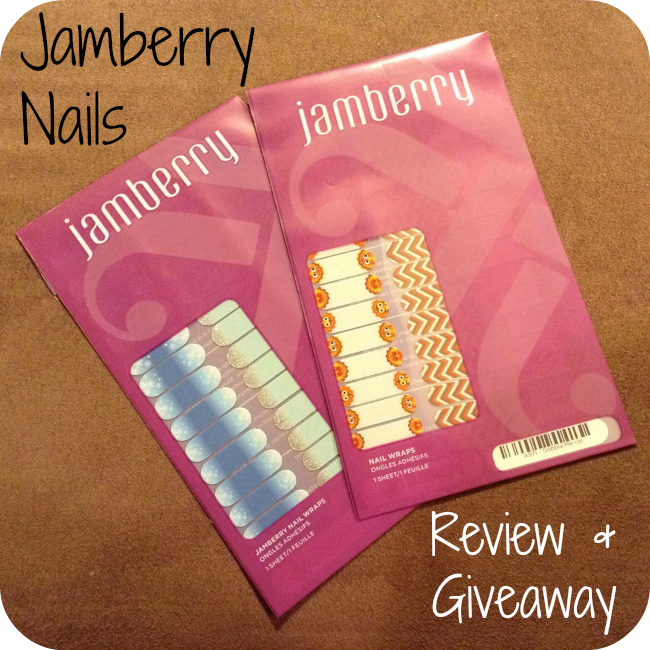 This giveaway is sponsored by Jill Flinton - Jamberry Nails Independent Consultant. One entry per household/IP address. Although I received free products to share this review and giveaway, no monetary compensation was received and all opinions are my own. I only recommend products that I would personally use and feel would be a good fit for my readers. This giveaway ends on January 19, 2014 at midnight. Entries are subject to change. Winner is chosen via Random.org, ALL winning entries ARE verified. One of my favorite wraps is the "All dressed up", it is dressy, but clean looking so I could wear them to work. I think the Crystalline wrap is pretty. I really like the love spell designs. These are really neat and hoping one day to try them. I love the SUGAR & SPICE they are so kewl looking. I love the mini polka dot and tropical mirage sheet the best. I like that you can have 2 designs on onw sheet. Melissa - the mini polka and tropical mirage is a junior sheet. Juniors are designed for up to about age 8, but can easily be worn as accent nails on adults. There are a few regular/adult designs that have multiple designs on one sheet. There is a section called "There's More" which has them all. 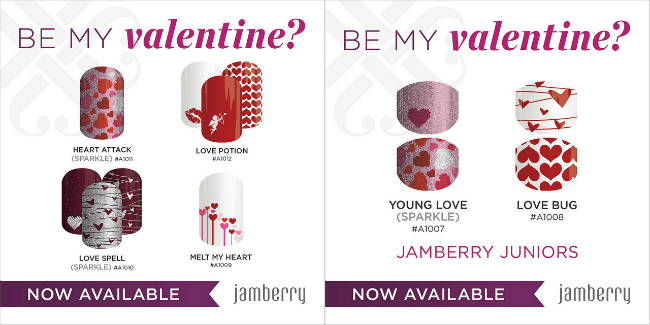 That's the beauty of Jamberry - you can do them at home! I really like the Rose Gold Sparkle! It would be great for multiple holidays! The design midnight celebration is my favorite. I like the Shine Bright set. I like the diamond dust sparkle. Simple but very pretty! Botanical gardens is so gorgeous! Id like the Love Spell and Midnight Celebration designs! I really like most of them, but my two favorites are Carnival and Silver Floral on Magenta. Silver Floral on Magenta is a very popular choice and is usually in the top 20 every month. I love the valentines collection. I love the Sugar & Spice as well as Diamond Dust Sparkle. My favorite design is Melt my Heart. I like the LOVE SPELL ones. These are neat. I like the Love Potion cupids and Poisoned styles! I love rosegold sparkle and gold sparkle...the whole sparkle solids collection! Marsala is the new Color of the Year, so there will be lots of options to match with it all year. I like the silver floral and touch of lace. So many cute designs. I really love the Mad Mod, I usually do that and have an accent color (usually a pink one like the sparkly fuchsia one). That sounds like an absolutely wonderful combination! I love the carnival and black lace nails. I adore the Rose Gold sparkle ones! They are so beautiful! I love the marsala mittens design! Marsala Mittens is only available during January, so if you want it, you have to order it by 1/31/15. My favorite design is First Frost! These would be for my daughter and I think she would like silver on magenta. Women of all ages wear them - from the age of 2 or 3, up to over 90! I like the Veiled design a lot. Rose Gold Sparkle is a universal wrap - it goes with just about everything! I just love the MELT MY HEART design so cute too. I really love the Love Spell design. Thanks for the giveaway! I love too many to pick a favorite, but Atlantis is next on my wish list! I like the Icy Berry Polka. I have a lot of favorites! The chevron pattern Everything Nice is one of them. I really like the Let it snow nails. Absolutely loving the Love Spell wraps!! Love Spell is the most popular wrap right now! Great choice. Melt My Heart is so adorable! My favorite is the Just Peachy wraps. I like the Melt My Heart wraps. They would be so fun for Valentine's Day! Orchid was the 2014 Color of the Year, so if you want that wrap, you may want to get it before 2/28 when the next catalog comes put. I think my favorite is the Birds of a Feather design. Feathers are so pretty! Hi! I love all of the Valentine designs! Another favorite is the Reminisce (Solid) design. So pretty with the florals. Thank-you for this super fun chance!! Midnight celebration is really pretty. Really like the Black bats, black and white check and quad, berry blend, black floral, white tip and widows web. Wow there are so many awesome designs! The Black Bats and Widows Web will probably be leaving at the end of February to make way for some great spring and summer designs. Those designs (or something similar) will return in September for the holidays. I really love the Shamrockin Jamberry nail wraps. I love the China Rose designs, so pretty! I like the Love Bug design. I love love love LOVE SPELL!!! 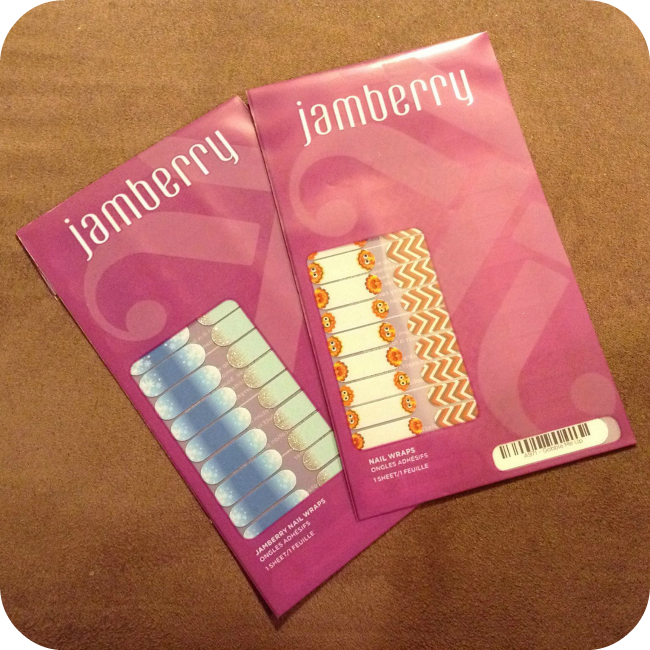 Love Jamberry! I love the Love spell the best but I seen a feww more that I liked too. The Collegiate and Sorority designs are a little more expensive due to the licensing costs associated with the schools, but they are a great way to show your support! I really like the Runner Girl design. I like Get Hoppy. Can you imagine having a cute little bunny on your nail? I love the love spell nail wraps! The Love Bug is my favorite! It looks perfect for the Spring and Valentine's Day! I hadn't heard that Marsala is the color of the year. Love the Marsala Chevron. The Marsala Chevron is available all year! Iced and Let it Snow and Snow and Ice (the junior set) were very popular for Christmas. I really like the SHAMROCKIN' design. Right now I'm really loving Rose Gold Sparkle. One of my favorite designs in the Love Spell the color is so pretty. There are so many pretty prints! I love the Twilight Blossom French tip. I could choose so many that are my favorite but with valentine's day coming I an loving Love Spell! I would choose the Hoppy designs! The little bunny would be perfect for Easter!